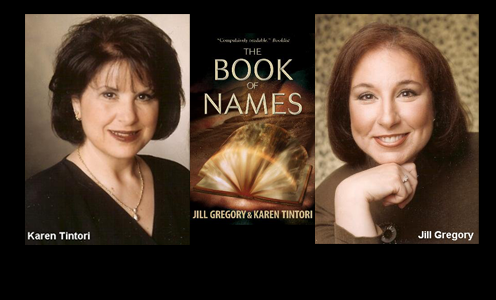 More than a dozen years ago, we first learned of the Kabbalistic legend that inspired us to write The Book Of Names. We had already written three books together – two novels (one of which was made into a CBS television movie-of-the-week) and one non-fiction, and were busily concentrating on our individual writing careers. Still, as long-time best friends who write with one voice and have a blast doing it, we occasionally tossed around ideas, always on the lookout for an exciting premise to springboard a new project. Unexpectedly, a tantalizing idea came our way. One of Karen’s adult bar mitzvah teachers told her about the mystical legend of the Lamed Vovniks -- the 36 righteous souls of every generation on whose merit alone, the Talmud says, God keeps the entire world in existence. What if someone knew the identities of this generation’s 36 righteous souls and decided to kill them to end the world? What if someone else had an intensely personal stake in saving them? We stared at each other in shock, certain we had a knock-out concept for a thriller -- a thriller that would bring together mysticism, the fight between good and evil, and the Jewish concept which teaches that if you save one life, it’s as if you’ve saved the entire world, and if you destroy a life, it’s as if you’ve destroyed the entire world. But we faced one impediment -- and it was a biggie. According to the sages, these righteous souls walk among us unheralded and unknown. Humble, compassionate, and innately pure, the Lamed Vovniks bring the light of the Divine into the world, and don’t even realize it. They have no idea of their specialness, or of their monumental role in keeping the world intact. Only God knows their names. We were stumped. We needed to create villains to target the Lamed Vovniks, and heroes to find and protect them, but since no humans know who they are, how would our heroes and villains be able to identify them, target them, save them? This dilemma stymied us for years. Sporadically, we’d return to our idea, but continued to draw a blank on a way to “out” our hidden Lamed Vovniks. We wrote other books, separately and together, yet kept being drawn back, pulled by the mystical allure of these 36 souls. In 2003, determined to find a way to bring their story to light, we scheduled a brainstorming dinner, and lingered well past coffee, batting ideas around with the ferocity of a match between Serena and Venus Williams. And suddenly, it was there. The solution for our protagonist’s special knowledge of the 36 – a solution so clear and luminous and perfect, we marveled that we hadn’t hit on it before. It not only gave us a launching pad for our story, it enhanced the mystical fabric of the tale. That summer, we walked for hours through Jill’s neighborhood, brainstorming non-stop, intent on fitting together the other puzzle pieces. Who were our villains? What was their motivation for seeking to destroy the world? How did they manage to pinpoint the Lamed Vovniks to eliminate them? And little by little we figured it out. Once we managed those initial breakthroughs, the plotting of the story which became The Book Of Names, and many other elements, fell into place. Rapidly, we outlined an international thriller based on a hidden history, one which would allow us to explore our interest in the Kabbalah, mysticism, gemstone lore, and the classic struggle between good and evil. Before we knew it, The Book Of Names began racing forward through our protagonist, political science professor David Shepherd, a man tormented by the mysterious names circling endlessly through his head. Names he’s been obsessively writing in a journal since a childhood accident that nearly took his life. Our research took us to the ancient study of Kabbalah, its link to the Tarot, the biblical story of Aaron, the High Priest, and his breastplate of magic stones, as well as Gnostic philosophy and Jewish numerology. From the beginning, we knew that a major event would take place near a specific site in London – and serendipitously, access to the location we created in our imaginations turned out to have a basis in fact. All along the journey, similar fortuitous “gifts” came our way. Almost mystically, you might say, all of these disparate elements slid together as if they’d been pre-cut for us by a jigsaw. That surprised us. Each bout of research led us to another layer, another connective thread in weaving our doomsday journey of apocalyptic proportions. We set out to spin a story that would take our readers on a thrilling adventure, but would also allow them to glimpse the world in a different light. But first we had to glimpse that world ourselves. And we did. We lived in it for the year it took us to write the book. Night and day we were as obsessed with the mystery of the Lamed Vovniks as was David Shepherd. We are delighted that The Book Of Names has touched readers worldwide, with translation rights sold to twenty countries. Whether in German, Dutch, Spanish, Turkish or English, good versus evil has never looked quite like this. Such is the success of this thriller, they are hard at work on The Illumination, what they term, their next hidden history thriller.